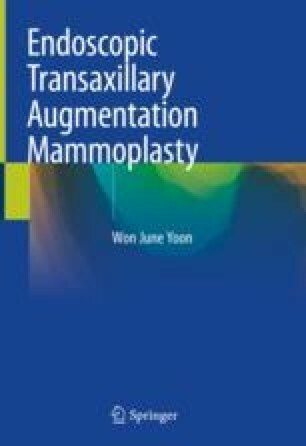 In addition to one of the most common complications, capsular contracture and implant rupture, several other complications may occur from augmentation mammoplasty. There are various complications; however, fatal complications are very low in probability, making augmentation mammoplasty a relatively safe group for surgery. In order to find a solution for these various complications, the operator needs to fully understand the exact cause and complication process in order to plan the treatment. Most patients who have had complications through axillary incision augmentation mammoplasty had required a reoperation using the inframammary fold incision approach. However, endoscopy sufficiently allows reoperation using the axillary approach. In this chapter, we will be further elaborating on approaching revisional augmentation mammoplasty using the axillary endoscopic approach. The author hopes that the endoscopic approach method will be further improved and research for various new surgical methods be developed.